Hayden Rhudy | American University | Washington, D.C.
Hayden Rhudy, SPA/BA ’05, was recently named one of the Most Influential Washington Women Under 35 by National Journal, because she “embodies how young, smart staffers can gain influence quickly on the Hill” and demonstrated her influence during the creation of the Affordable Care Act. Growing up in a family of health care providers – including a doctor, a pharmacist, and a social worker – helped Hayden understand the importance of health care from a young age. She changed majors from art history to communications, law, economics, and government (CLEG). “I came to AU because I thought it would give me the opportunity to do some good and make a difference in the world. I really wanted to get involved in policy and healthcare. … At the time, I didn’t realize how important government affairs would be in the healthcare arena as it is today,” she says. Hayden interned at Amgen, a biotech company, while she was a student at AU. This experience combined with her AU major meant Hayden was more than ready when the Affordable Care Act arrived for markup at the U.S. Senate Health, Education, Labor, and Pensions committee, where she worked for ranking member Senator Mike Enzi (R-Wyo.). She also played a role in the Senate Finance Committee markup and floor debates. When she later worked for Senator Orrin Hatch (R-Utah), Hayden focused on parts of the law regarding implementation of the health care exchanges and regulations on private insurance. All told, Hayden spent a grueling year writing and amending the landmark healthcare law while also taking classes at John’s Hopkins to earn an MBA and a master’s degree in government. 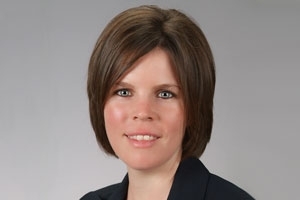 Hayden has since left her job in the Senate to become director of therapeutic area strategies for AbbVie, a global biopharmaceutical company, where she will use her healthcare knowledge and influence in their government affairs division.